This week’s YouGov poll for the Times has topline figures of CON 42%(nc), LAB 40%(+1), LDEM 9%(nc). Fieldwork was Monday and Tuesday and changes are from last week. The two point lead is a little lower than YouGov have been showing of late, but nothing outside normal sample variation. On the other regular YouGov trackers, 44% of people think that Britain was wrong to vote for Brexit, 43% think it was right. Just 22% of people think that the government are doing well at negotiating Bret, 62% think they are doing badly (including a majority of both Leavers and Remainers). While the poll was taken after the government’s announcement of extra funding for the NHS, it has unsurprisingly has little impact on which party people trust more on the issue – 34% of people think Labour would handle the NHS better, 24% think the Conservatives would. Full tabs are here. While it’s not a particularly new poll (the fieldwork was conducted the weekend before last) there was also a newly published BMG poll yesterday. Topline figures there were CON 38%(-1), LAB 41%(+2), LDEM 11%(+1). Changes are since early May. This is the only poll since mid-April to have shown Labour ahead. Full tabs are here. UPDATE: A third poll out tonight. Survation have topline figures of CON 41%(nc), LAB 38%(-2), LDEM 7%(-2). Fieldwork was Tuesday to Thursday and changes are from the start of the month. The poll has some more questions on Brexit – full details are here. A year since the election, we have two new GB voting intention polls (from YouGov and Survation) and a new Scottish poll (also from YouGov) today. Looking at the YouGov/Times GB poll first, voting intentions are CON 44%(+2), LAB 37%(-2), LDEM 8%(-1). The seven point Conservative lead is the largest since the election but normal caveats apply – it is only one poll. 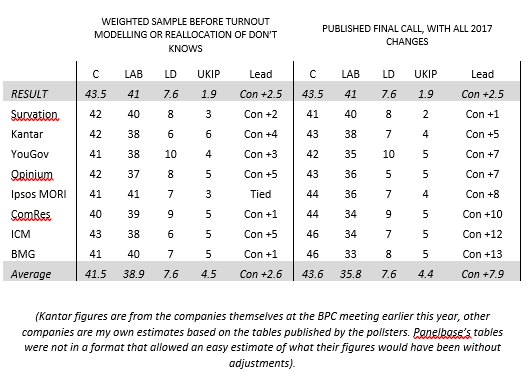 Over the last two months YouGov have been showing a steady Conservative lead of around 4 or 5 points, so normal sample variation alone is enough to explain the occassional 7 point lead. Watch the trend, rather than getting excited over individual polls. Full tabs are here. Survation‘s topline figures are CON 41%(nc), LAB 40%(nc), LDEM 9%(+1). Changes are since mid May. Like YouGov, Survation have shown a steady position for the last couple of months, but there’s an obvious contrast in terms of what that position is – YouGov have a steady small Tory lead, Survation are showing the parties steadily neck-and-neck. 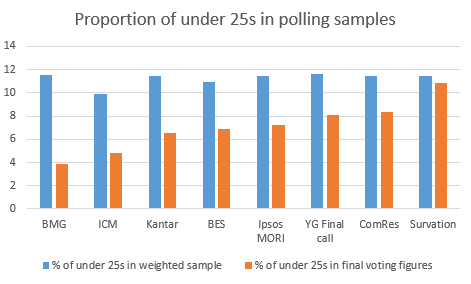 As I’ve said before, there’s not an obvious methodological reason for this (while Survation have a very distinct sampling approach to their phone polls, this is an online poll and their online polls use broadly similar methods to YouGov, ICM and other companies, so there’s no obvious reason for differing results). Full tabs for the Survation poll are here. Holyrood regional: CON 26%(+1), LAB 21%(-1), LDEM 7%(nc), SNP 32%(nc). Changes here are since the previous Scottish YouGov poll, way back in January. There is very little movement in Holyrood support, but in Scotland the Conservatives have moved back into second place. Full tabs for the Scottish poll are here.